On March 6, the Notre Dame community was proud to welcome Mayor Marianne Ward into our school. Mayor Meed Ward spoke during fourth period in the Lecture Hall to students of varying grade levels, discussing the topics of mentorship, persistence, and equality. first door at the start of campaigning season, calling it one of the hardest things to do. While most people were very polite and receptive during her campaign, ​​Mayor Meed Ward talked about the hardships of dealing with people who were rude and disrespectful. 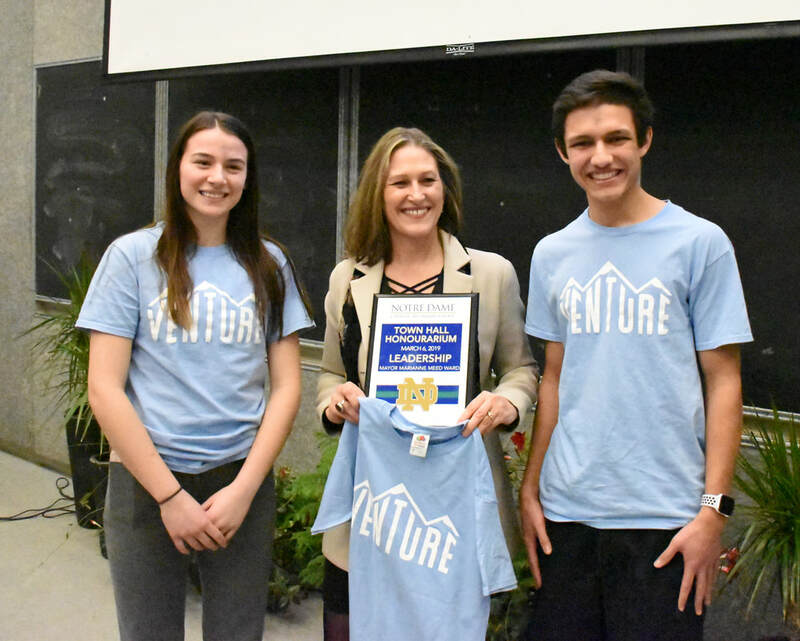 The importance of separating your own responsibilities from that of others, by making people accountable for their actions, is something that the mayor strongly believes in and offered as advice to Notre Dame students. On March 2nd, I had the pleasure of attending Burlington’s 22nd Annual International Women's Day Breakfast. The morning took place in the Holiday Inn Ballroom where hundreds of women of all ages gathered on a day of empowerment. 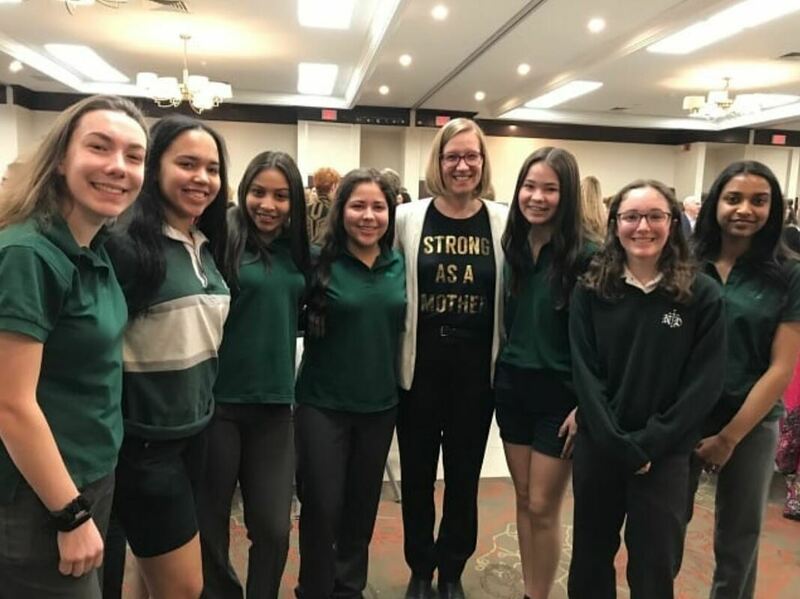 Notre Dame was proudly represented by eight female students as well as Ms. Vanderkooy and Ms. Obrovac. Breakfast consisted of steaming scrambled eggs, well-cooked bacon, perfectly crisp home fries, and deliciously brewed coffee. My fellow students and I had a chance to connect with the three woman we were sharing our table with while enjoying our meal. Our conversation was encouraging and eye opening. Since 2005, Women as Career Coaches has brought together over 10,000 women from the Halton Community with the goal to connect the community by providing an opportunity to listen to and learn from inspirational speakers and mentors. Over 700 students and career coaches attended this inspiring and motivating event. Students and coaches from different professions were invited to attend this special evening. Even Prime Minister Justin Trudeau acknowledged the importance of the Women as Career Coaches event in a letter that was read during the event. The Mayor of Burlington, Marianne Meed Ward was also present at the event. The ND Social Justice Club is excited to announce our most recent initiative called the “ND Purse Campaign”. The Purse Campaign, put forth by our Social Justice Club members, was launched on International Women’s Day. Our main goal is to raise awareness about social justice issues amongst families, particularly women facing domestic abuse in our community. We hope to achieve this through collective giving by donating new or gently used purses. We would also like to fill the purses with toiletries such as toothbrushes, toothpaste, floss, razors, feminine products, moisturizers, tweezers, shampoo/conditioner, deodorant, just to name a few. We feel that this is a great opportunity not only to help women, but to educate the male population in our school to also get involved in our initiative. Our goal is for every homeroom class to collect at least 1-2 gently used purses and fill them with some of the toiletries listed above. If every homeroom class contributes at least one or two purses we feel we will be very successful in this campaign. As well, if there are any parents or students who would like to contribute a filled purse on their own, they will gladly be accepted. Together, we can make a difference and contribute to a great cause. 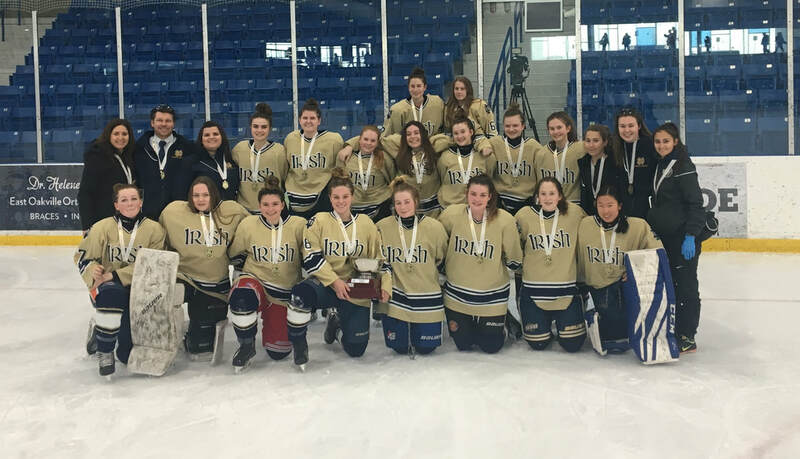 From a phenomenal start to a melancholic ending, the Varsity Girls Hockey team played exceptionally this season and have every right to feel proud. The girls were held to a high standard at the beginning of the season due to their great run from last year says Emily Clark, the team goalie. Senior Sara Boucher added “our coaches had told us from the start that they knew we had a lot of potential as a team”… and that they did! The first game of the season was against Corpus Christi on November 15th at Appleby Arena and the team won 4-1. The girls started off strong and kept on going up since then, finishing the regular season with an undefeated record. 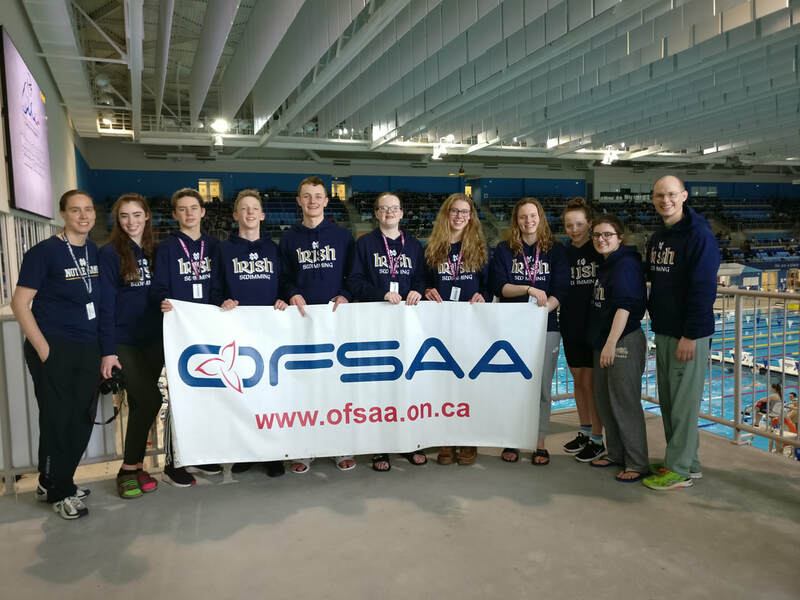 The Notre Dame Swim Team had one of its most successful years ever at the 2018-2019 OFSAA Swimming Championship. We finished 24th in the province out of 315 schools. The success of our team this year was directly related to our swimmers swimming personal bests (or very close to them). Graduating swimmer Ruben Jansen was the anchor of our Open Boys team, and had an excellent mee,t finishing 9th in the 200 Free and 11th in the 200 IM, both times being his second best ever. The Open Boys Medley relay consisting of Josh Matz, Ruben Jansen, Olaf Jansen and Owen Robinson finished 16th which is the highest we have ever placed in that relay in school history. The open boys 4 x 100 relay finished 16th as well and beat our entry time, despite not having our fastest swimmer in the event. Led by a personal best in the 100 free by Josh Matz, and followed up by personal bests by Olaf Jansen and Rafael Rozo in their legs of the race and anchored by an impressive swim by Owen Robinson who swam his second best 100 Free ever. On Thursday, March 21 Notre Dame held its Arts Night and Buskerfest, featuring various artworks created by students. The event was open to the entire Notre Dame community, and was a resounding success amongst the Notre Dame staff and students. The event ran from 6-9 p.m. on Thursday, and gave members of the community the opportunity to view student artwork, performances, and poems for only $2 at the door. Visitors were able to buy snacks, customized buttons, homemade crafts, and view live painting. Students in hand painted environment-themed dresses were available to answer questions about artwork and take photos. Some of the artwork included visual and media arts, musical performances, poetry, Irish dancing, the live painting of a sea turtle, and the environmental dresses which covered various issues. Student artwork was found primarily in the library, as well as many of the musical performances, including the school band. Snacks for purchase included popcorn and brownies, and homemade sculptures were also available. The event was a large success, and both students and staff alike reported having a great time. Much of the artwork was created by both art classes and the art club, and many other performance contributors auditioned prior to the event. The event runs annually, and new talent is always welcome. On Monday, January 14th, Notre Dame’s Mathletes took a trip to McMaster to experience “Math at Mac”. Markus Hogg is a sixteen year old boy; He is athletic, and plays various sports. Markus academically shines and is an active member in his community. In October of 2018 he was admitted into the hospital and was diagnosed with Chondroblastic Osteosarcoma, a cancer affecting bone cells. The cancer has put him through months of chemotherapy and tremendous amounts of pain. On February 18th, Markus went through a huge surgery. The purpose of the surgery was to remove some of the tumour and the bones that were affected. Sadly this surgery left him paralyzed from the waist down. In spite of this, Markus is staying strong, regaining strength, and maintaining a positive attitude. No teenager should endure this type of physical and mental pain. A sixteen year old boy should be worrying about tests, work and extracurricular activities. Springtime is a time a teenage boy should be worrying about getting a date to the semi-formal and school sports teams, not hair loss and medication. This is not what a 16 year old should not be going through. Cancer is an ongoing issue that affects millions every year, but we never fully understand it until it happens to us. Markus’ story is a reminder that cancer could happen to everyone. The normalization of cancer is tragic in its own way, but Markus is anything but tragic. His bright smile lights up an entire room, and his laugh is contagious. Although cancer has limited what he can do with his body physically, mentally Markus is doing unimaginably well given his condition. In Canada we are blessed to have a great and free health care system that covers some of Markus’ treatment, but what about the post-treatment care? In order to walk around in his own home, Markus is needs a wheelchair and chair lifts. The renovations in his home that need to be made in order to make it accessible for him will be extremly expensive. A GoFundMe page was set up to help fundraise for the Hogg’s to help with the post-treatment care. All donations will be greatly appreciated, or if you would like to make something like a craft please do so.